Includes the Manuals and the Software (now sent via download) for Volumes 1, 2, & 3. Beautifully animated, Children's Music Journey incorporates a "teach, practice, apply" methodology and ensures kids have fun learning by taking part in engaging lessons, activities and games. In the home or classroom, children as young as four can learn piano, guaranteed! Ages 4 - 10. MIDI keyboard required for use with computer. This software is now sent via Download. Links will be sent to your email within 2 business days after you place your order. I have 3 children using the Children's Musical Journey, ages 8, 6, and 4. They love the lessons and the games. My son loves the practice room with Miss Melody. They have gone through it so quickly that we are ordering the second one. The lessons are easy to follow, the characters are fun, the games are challenging without being too hard. The best part is that I don't have to take multiple children to lessons and pay for each one of them. The software corrects the children immediately when they make a mistake, so they learn very quickly if they are out of position. Very fun! Highly recommend it. Overall I'd give "Children's Musical Journey-Volume 1" a 4 out of 5 star review. The graphics are fun and engaging for children and there are plenty of activities to supplement each lesson and keep your child interested in moving from one lesson to the next. They won't get bored. In Volume 1, they are introduced to music at a very basic level that my 3 year old has no problem mastering. The workbook gives a great paper supplement activity page to help cement in each lesson, these are completely optional but tons of fun. 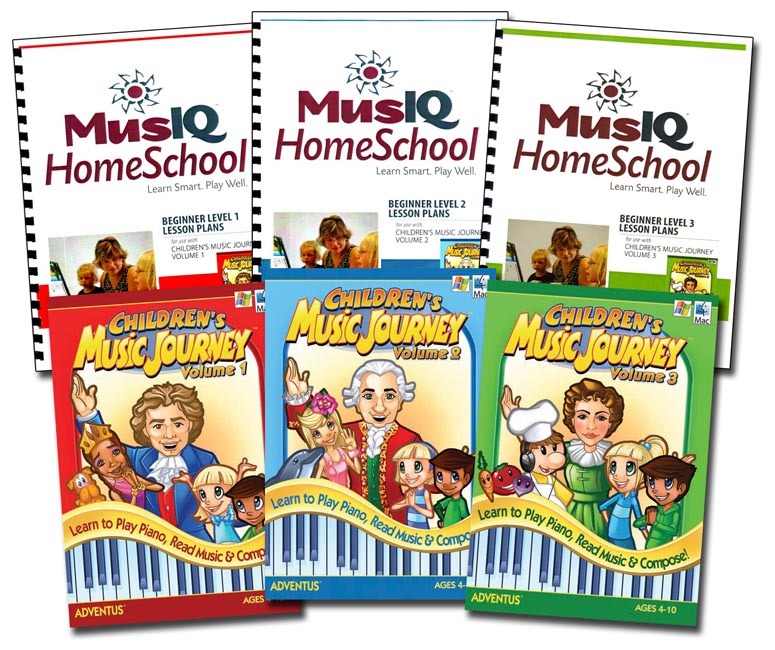 Your child will move through a series of famous composers as cartoon teachers including Bach, Beethoven, Joplin, Mendelssohn, and Villa-Lobos all while be introduced to some of the most famous classical pieces ever written and a bit of history on each piece and composer, I just love that! Each lesson builds upon the last in a slow methodical approach so that this can be used by families with absolutely no musical background whatsoever to easily grasp the language of music. We have one older sibling who has taken 3 years of violin lessons and soon wanted to complete each lesson too after seeing how fun they were even though he is far beyond the concepts! That says a lot, these are fun! The only negative feedback I have is, one of the characters that leads a few activities is obviously a "rapper" with his slouchy pants and side-turned hat. His portrayed mannerisms are not in-line with what most Catholic parents want to represent to their children as acceptable dress and behaviour (not that he says anything bad-he's just obviously not the most Godly kind of guy, it's not a personal image I want my son to view as normal even though it's everywhere in our culture). The second negative is we wished the concepts actually moved a bit faster. It does seem to take quite a few lessons before we get to the point where the kids see that each note has its own name and how to recognize them. Your child would have much more hands on note recognition with private lessons, but if that's not an option or if it's out of your budget this will still give them a complete and thorough introduction to piano skills and technique. For going a route with no in-person teacher this really does start slowly. This can easily be finished in less than the allotted 25 weeks by moving through the early lessons a little faster as you see fit. Overall, even with a few minor drawbacks I was highly impressed with this software for it's practical, fun, and educational value. Bravo to the brains behind this one! This was much more convenient than private lessons as we did these lessons on our own schedule with no hassles of driving (great for large homeschooling families!) and I loved that different children moved through the program at their own paces simultaneously. I'd definitely reccomend it to other families and my kids can't wait to get into Volume 2 and 3. Thanks, Seton, for another great resource!